This class will be offered in the BORP fitness studio Thursdays and Fridays 9-10 am from June 14th until the end of July. Kelly Noah received her 200 and 300-hour yoga teacher training from Piedmont Yoga Studio from 2016-2018. She teaches and practices Hatha yoga with an emphasis on easeful movement, strengthening postures, and meditation. Kelly believes that yoga offers a unique opportunity to increase easeful body movement and deeply connect with oneself at the same time. In addition to Piedmont Yoga’s Deep Healing, Spiritual Justice, and Nature as Teacher training, Kelly has also taken the Prison Yoga Project training, The Art of Yoga Project training, and Leslie Howard’s Pelvic Floor training. Kelly is also an avid swimmer and swim coach, and when she is not at the pool or on the mat, she enjoys dancing and cooking. Class description: Exploring the basic postures and breathing techniques used in Hatha Yoga, this class encourages gentle opening of the body and increased mind-body awareness. Using a combination of easeful movement, strengthening postures, and meditation, this class moves at a slow pace and is well-suited for beginners as well as seasoned practitioners looking to slow down. 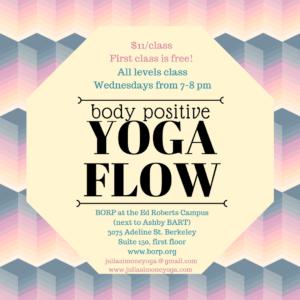 ​​Class description: Body Positive Yoga Flow is a Vinyasa style yoga class suitable for all levels. Class will focus on linking conscious breath with a mindful flow. Class will begin slow, build up to a vigorous standing sequence, and cool down with relaxing floor movements. Students can expect to build strength, flexibility and concentration while heating the body and calming the mind. Modifications will be provided to make poses accessible for all levels. Questions? call Nancy at 415-346-8119. Board the sleek new SMART train and discover Sonoma County without having to deal with traffic or parking. This new passenger service between San Rafael and Santa Rosa–eventually extending to Cloverdale, offers a smooth, quiet ride and some pastoral scenery. 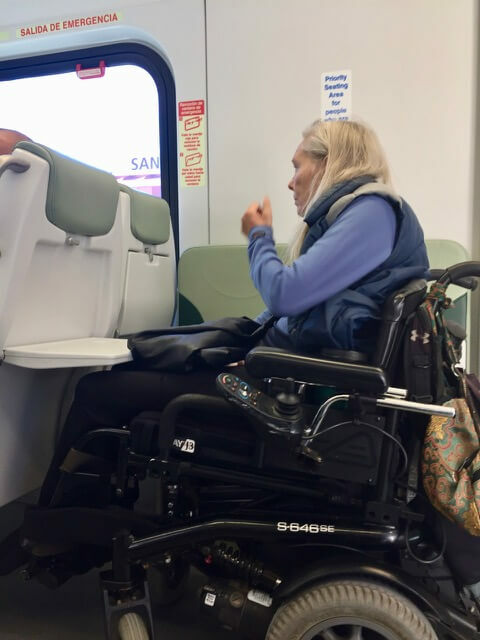 Passengers in wheelchairs can board any car via a sloped entry and there’s even an accessible bathroom on board. On the downside, the 2 wheelchair spaces in each car do not have windows, the small fold-down tables are pretty useless, and there is no companion seating. For a nice day trip, board the train in downtown San Rafael and disembark in either Downtown Petaluma or Railroad Square in Santa Rosa. Within easy walking distance at both destinations you’ll find shopping in preserved old buildings that house a mix of boutiques, antique shops, specialty stores, and restaurants. From the East Bay, it’s possible to take public transit the entire way by taking BART to the Del Norte station, then board the 40 westbound bus to the San Rafael Transit Center where you catch the SMART train. Visit their website for schedules and fares.